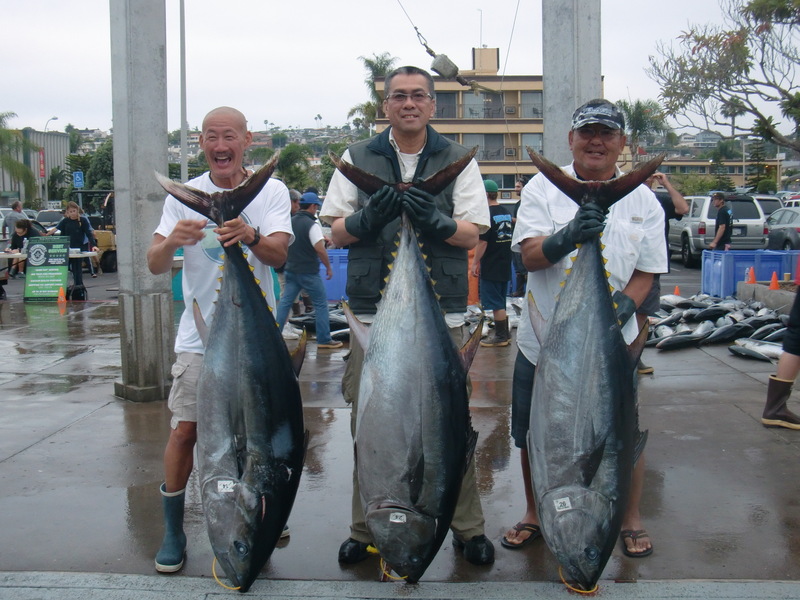 Can you imagine catching a gigantic 136 lbs Bluefin Tuna? Hard to imagine, especially, I was told, that one does not see such big bluefins (over 100 lbs) in this part of the country. But that’s what some of our friends did this past week, coming back on July 4th with these rare huge bluefins. What do you do with such a big fish once it is caught? Eat it, naturally! But one cannot consume such a big fish by oneself, so one has a fish party. First of all, it is already a feat to be able to go out to the deep sea to do this type of long-range big game sport fishing. I, for one, cannot even go across to Catalina Island on a ferry without getting really sea sick, so this type of fishing is not even possible for someone like me. Then one has to have plenty of time, money, to be in good physical condition, and to have the necessary stamina in order to endure the sometimes lengthy and harsh trips(ranges from 2 to 18 days), not to mention the difficulties of wrestling with these large fishes. Fortunately, I happen to know some of these people who have all of the above and who will share their extraordinary catches with the rest of us. “An experience of a life time!”, exclaimed my friend, the fishing enthusiast, who just came back from the 4-day trip to Baja Mexico, about 250 miles south of San Diego. I was told that it took him well over an hour to battle the bluefin once it got hooked up, and that it took about 500 yards of line before the fish finally admitted defeat. With understandable excitement on his face, he recounted how he had to go around the boat 5 times just to chase the fish, all the while trying to hang on, and to keep hydrated by drinking water. I think his arm was still a bit numb and sore from the exceptionally long and challenging combat with the fish. 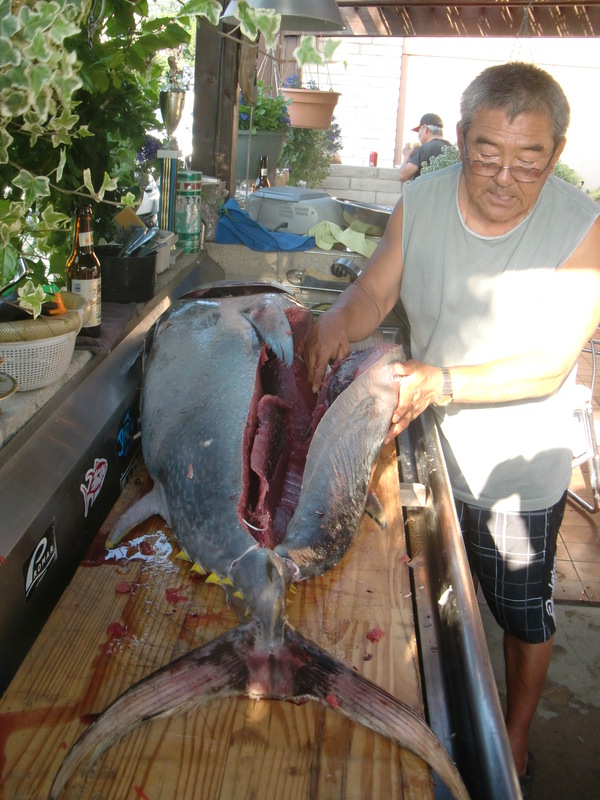 As big as his tuna was, it was not the heaviest, the jackpot fish was 154 lbs. Being that it was so rare and unusual to see such big bluefins in this part of the country, these catches were indeed once in a life time event. The trip cost over $1700 for the 4 days. 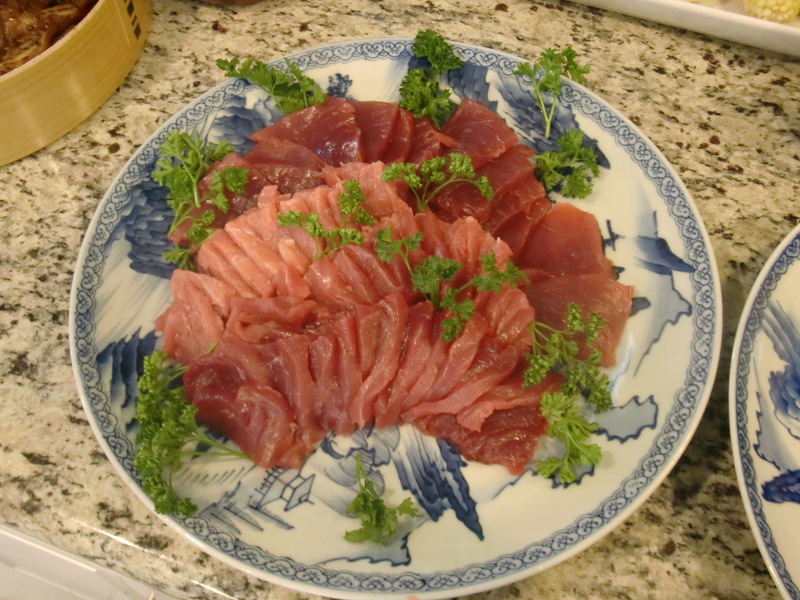 If the fish was to be auctioned off in Japan, it could fetch over $10,000 US, so we were indeed quite the fortunate bunch to be able to have a taste of this tuna. We were reminded that it would cost around $10 per piece if we were to have it in a restaurant, and it would not even be as fresh. 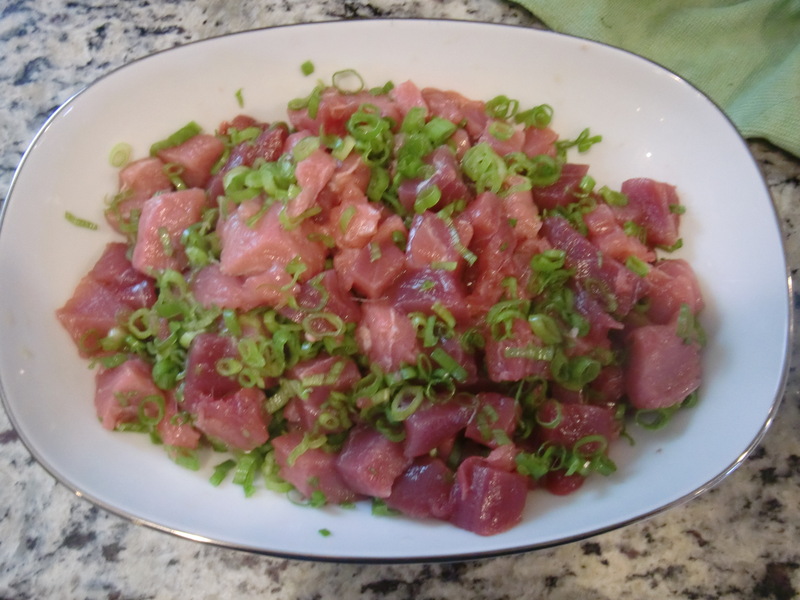 The yellowfin tunas, on the other hand, were the more common ones. In previous expeditions, some of the guys from this group had caught yellowfins weighing over 300 lbs! In addition to catching these large bluefins this time around, there were smaller ones that were caught weighing in around 18-66 lbs, as well as some good size yellowtails. 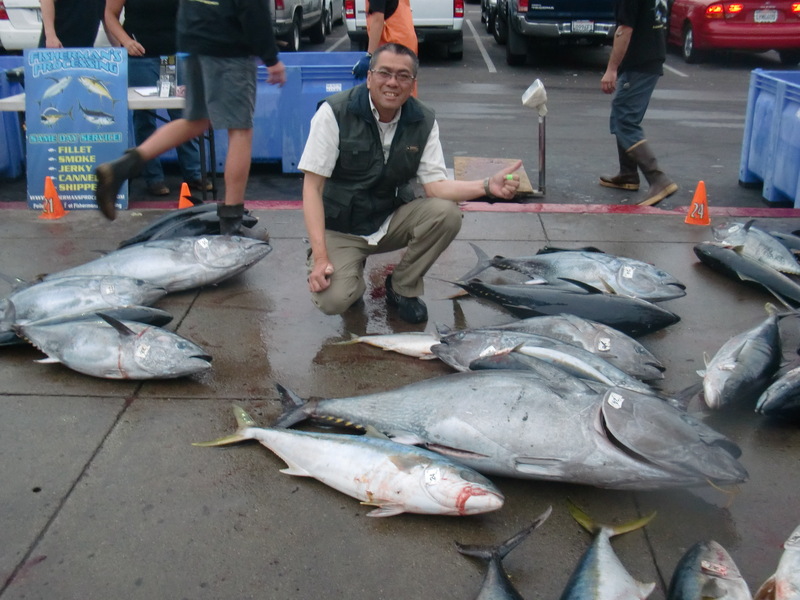 The host, a first generation Japanese, was waiting for everyone to arrive before proudly showing off his bluefin. 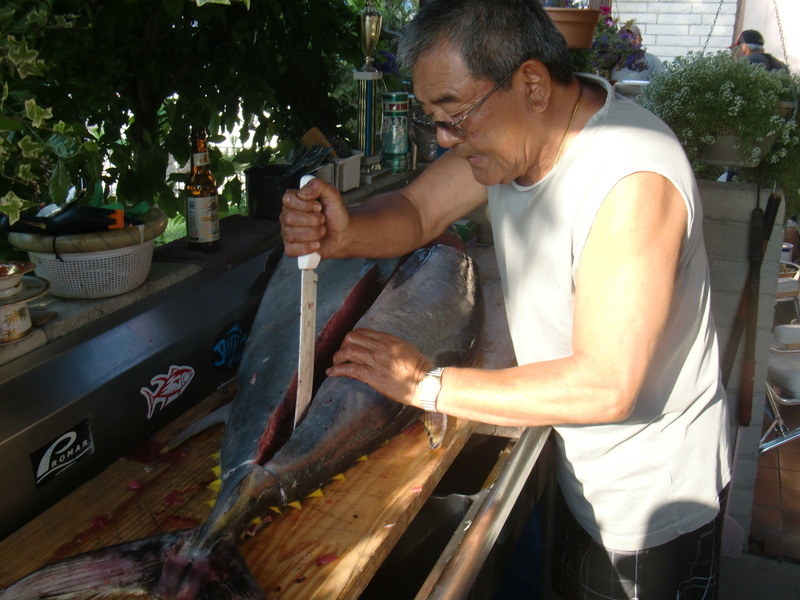 With years of experiences behind him, he expertly put the knife to the middle of the fish and began cutting. Before long, platters of beautiful, shiny, tuna sashimi in various shades of red were laid out on the table. In addition to the bluefin sashimi and sushi, we were treated to yellowtail sashimi as well as cooked yellowtail collar(hamachi kama), of which is one of my very favorite. 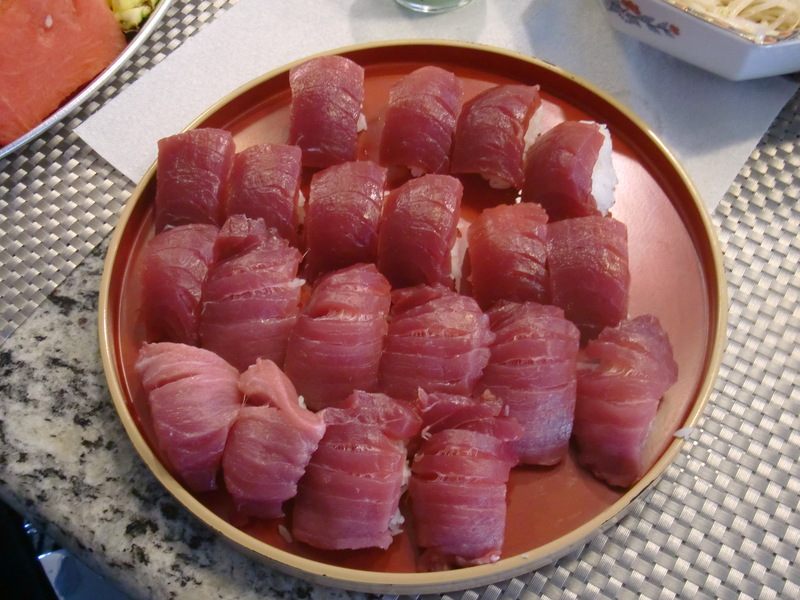 How should I describe the taste and mouth feel of eating a piece of bluefin tuna? The taste is not strong at all in flavor, but incredibly and luxuriously rich and fresh tasting, with a texture that is silky smooth, and a melt-in-your mouth sensation. I usually do not use soy sauce in order that I could truly taste all of the fish without any contamination. A tiny dab of wasabi was all I needed. The dinner, the opportunity to taste such freshness, such delicacies, with these true and dedicated fishermen, was in itself, no doubt, an experience of a lifetime for all of us there. Once in a life time experience indeed! Wow that is incredible. It was probably so delish! It was fun and tasty! I am in minority here. I am one of those people who believe that if we continue kill these beautiful wild creatures, who have done nothing to us. Then pretty soon they will just a memory and picture in a history book. And that’s me speaking as an ex-fisherman, ex-hunter. Fortunately I learnt to stop and smell the air and photograph it rather than shoot it! I am not condemning the people who did this, because I remember the excitement also, but I am just pointing out that maybe we should stop and think for a moment. I actually do agree with your point of view. I think we get caught up in the excitement and forget the big picture, thank you for reminding us.